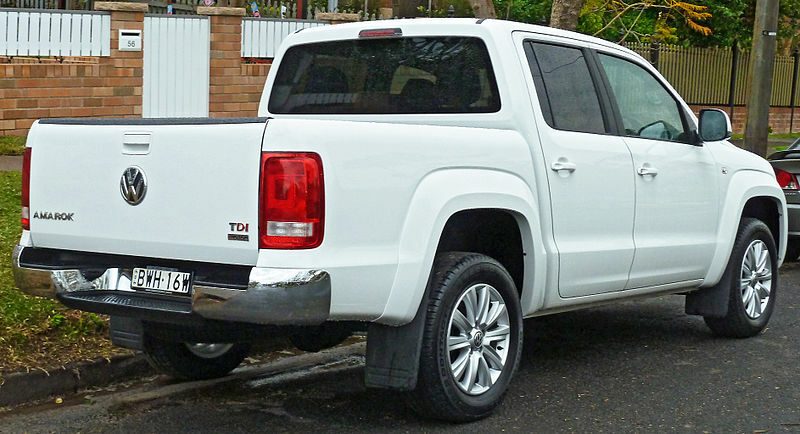 The Volkswagen Amarok is a mid-size pickup truck built by Volkswagen Commercial Vehicles (VWCV). It is a traditional body-on-frame truck with MacPherson struts suspension at the front and leaf springs at the rear. 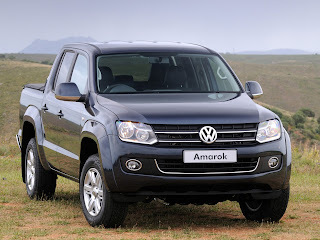 The Amarok range consists of single cab and double cab, combined with either rear-wheel drive or 4motion four-wheel drive, and is powered by turbocharged gasoline or Turbocharged Direct Injection (TDI) diesel engines. VWCV considers the Toyota Hilux, Nissan Navara and Mitsubishi Triton to be Amarok competitors, although it is bigger in size. In 2005, Volkswagen Commercial Vehicles announced their intent to build the Robust Pick-Up and off road family of vehicles. In 2007, automotive website WorldCarFans.com published the first photos captured by RoAnSa Carspy Photography of the development mule of the Robust Pick Up concept vehicle wearing Toyota Hilux sheetmetal on a Volkswagen-developed chassis. In March 2008, automotive spy photographer Hans Lehmann captured the first image of the Robust Pick up wearing a production body which is designed by Walter de Silva. In September 2008, Volkswagen released the Robust Pick Up concept in a Search and Rescue (SAR) vehicle color scheme; the design is said to be 95% a production version. 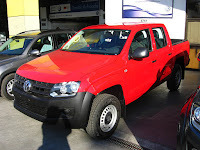 The Amarok, the first pickup from Volkswagen Commercial Vehicles, was presented to the general public in General Pacheco, Argentina on the 7th of January 2010. Following the launch in Argentina, the Amarok was a key support vehicle in the 2010 Dakar Rally, with 45 being used. Revealed to the public on 4 June 2009, "Amarok" means "wolf" in Inuit, and Interbrand also claims it is associated with "he loves stones" in Romance languages. It also resembles "tomorrow" in Irish. It is also the title of a 1990 record album by musician Mike Oldfield, a 2000 album of the German black metal solo project Nargaroth, and the name of an open-source music player (version 1.0 in 2004). Volkswagen's association with 'Wolf' is referenced on many of its vehicles. Up until the 1980s, the 'Wolfsburg Crest', in various guises, was displayed on VW products, the most famous being the Type 1. Up until 1964, the Wolfsburg crest badge was placed on the bonnet. The crest also appeared on the steering wheel hubs on many models. The Lupo (Italian for Wolf) was named in honour of Wolfsburg, the home of Volkswagen. The Amarok is powered by a range of Turbocharged Direct Injection (TDI) common rail diesel engines, and Fuel Stratified Injection (FSI) petrol engine. Fuel consumption in a combined cycle format is as low as 7.6 L/100 km (37 mpg-imp; 31 mpg-US) on the rear wheel drive variant to 8.1 L/100 km (35 mpg-imp; 29 mpg-US) on the 4Motion theoretically giving the Amarok a 1,000 km (620 mi) range before filling up for fuel. As of the 2012 Model Year Volkswagen has introduced two more engine configurations, 2.0L TDI 90 kW motor upgraded to 103 kW of power and a 2.0L Bi-TDI which has an optional 8-speed ZF engineered automatic transmission. 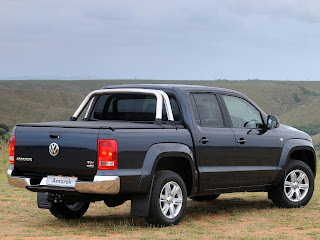 On 22 September 2014 Volkswagen is launching a limited edition Amarok Dark Label model.The new Volkswagen Amarok Dark Label is fitted with the company’s range-topping 178 bhp 2.0-litre BiTDI engine, generating up to 420 Nm of torque and offering a maximum towing capacity of up to 3,200 kg. The Amarok has three drive concepts: rear wheel drive, Shiftable 4Motion and Permanent 4Motion. The Shiftable all wheel drive system can shift drive between the axles whereas the Permanent full-time all wheel drive system distributes power through a Torque Sensing (Torsen) differential with a 40:60 ratio between the front and rear axles. The Amarok is currently being produced in the Volkswagen Group plant in General Pacheco, Argentina; for South American, Mexican, Oceanian, South African, Russian, and European markets. It is expected to produce 90,000 Amaroks annually once production it is at full capacity. The Hanover site was originally dropped from possible sites to produce the Amarok due to the Global Financial Crisis and increasing economic costs in Europe in 2009. In September 2010 it was decided by the Volkswagen Group Board of Management that 40,000 Amarok pickups will also be built in Hanover, Germany for the European and small volume markets from the middle of 2012. The 100,000th Amarok was produced on the 8th of October 2011. Amarok introduced at Taiwan market from 2012 (2.0BiTDI 6MT highline). Currently the Amarok is available in South America, Australia, New Zealand, and South Africa, Russia as well as the rest of Europe. However, a recent exodus of other mid-sized pickup lines in North America has created an opening in the market. VW is in talks with Canadian and U.S. dealerships to introduce the pickup to the continent. Three equipment lines will be offered on the Amarok; base version, Trendline and Highline. The base version comes equipped with 16-inch steel wheels, height-adjustable front seats, variable folding rear bench seats, locking glove box, cargo platform lighting, antenna integrated within wing mirrors, manual window regulators, manual door locking and manual wing mirror adjustment. The front bumper, wing mirrors and door handles come in black. The Trendline grade has over the base version electrically operated door locking, electric windows and wing mirror adjustment as well as a radio with a CD player, climate control (Climatic), multi-functional display, cruise control, front fog lights, 17-inch aluminium wheels. Also painted in the body colour are the front bumper, door handles and wing mirrors. The Highline grade has over the Trendline part chrome mirror housings, chrome strips on radiator grille and around the fog lights, chrome rear bumper bar 18-inch aluminium wheels, automatic climate control (Climatronic), leatherette/leather fabric on the interior. 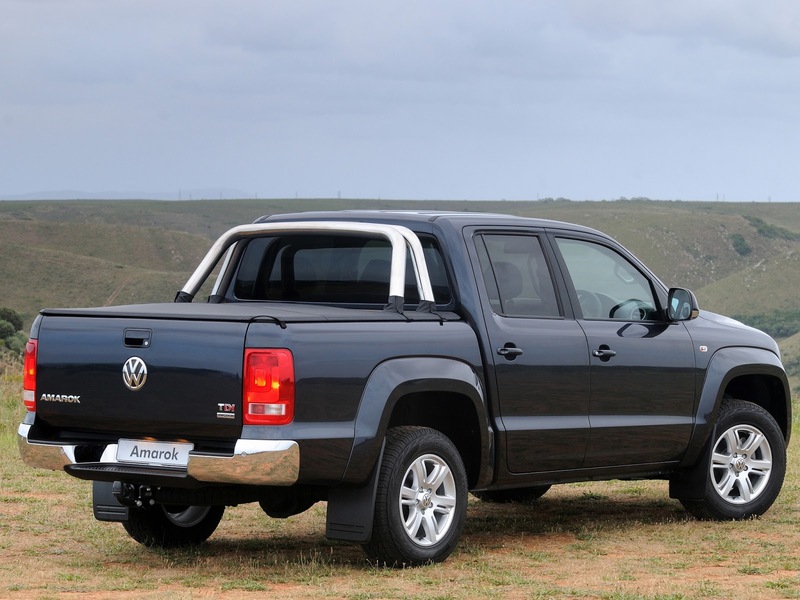 The Amarok was launched in a Double Cab variant with the Single Cab first launching in late 2011 in South Africa and Europe. Offers an extended bed with 2.21 meters of space and a slightly longer wheelbase. In 2006 the Australian publication Transport Today reported that Phil Clark, Volkswagen Commercial Vehicles Director in Australia, was trying to persuade Volkswagen's head office to add a chassis cab programme to Project RPU. Cab Chassis variants of both the Single Cab and Double Cab will launch with the 2012 Model Year range. This variant will only be available in Russia. It adds extra exterior chrome trim, a navigation system and an updated interior. The Polar Expedition variant was designed to promote the 2014 Sochi Winter Olympic Games in the remote areas of Russia. Three of these trucks were built to carry 9 people 9,942 miles east by road from Moscow to the city of Petropavlovsk-Kamchatsky on the Kamchatka peninsula. The team of 9 earned the Guinness World Record for the longest off-road journey through one country. The team took 66 days to reach Kamchatka from Moscow by driving over the glacier-covered Sredinny Range and were the first people to do so. The specially built Amaroks received a couple of upgrades to take on the cold and road less wilderness. The team replaced the front and rear suspension with long-travel, heavy-duty shocks and massive tires with deeper ridges for extra traction in deep snow and ice. The body was unmodified except for cutting out the fenders to fit the wheels and tires. The 2.0L turbo diesel engine remained mostly unmodified because the goal was reliability. For added safety, the interior was fitted with a roll cage and navigation equipment to make sure the team didn't get lost. Rumoured platform spin-offs include a five to seven seat SUV to compete with Nissan Xterra and Toyota Hilux SW4 to be built in Brazil for the South American and European markets. The Netherlands Ministry of Defence has announced plans to phase out other vehicles, including the Mercedes-Benz G-Wagen, in favour of the Amarok to move to a single type of truck for peacetime operations. The stated aims for this plan are to purchase 1,667 new vehicles for the Army, the Navy, the Air Force, and the Marechaussee. Volkswagen revealed their one tonne pickup study at the 2008 IAA Commercial Vehicle Show in September; the SAR Pickup measures 5.18 metres (17 ft) in length and 1.9 metres (6 ft 3 in) in width, and the 1.55 metres (5 ft 1 in) long cargo bed can carry a Euro sized broad pallet sideways. Possible production features that were on the concept: radio navigation system controlled by a multifunction touch screen, differential locks, cable winch and the rear logo opens the tailgate. 2008 SAR Concept Pickup at Melbourne International Motor Show 2009. Last updated on 11 June 2015 at 07:30.